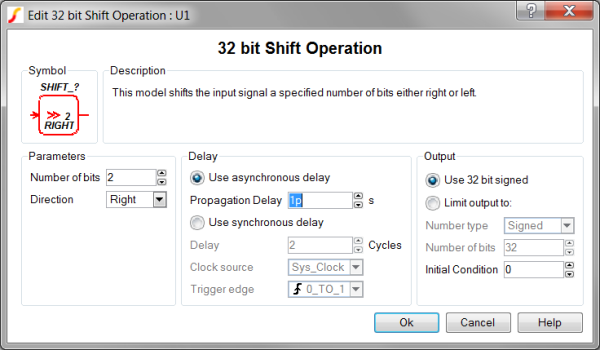 The SystemDesigner Shift devices model a left or right shift operation. If the Direction is Left, the output is multiplied by 2 Number of bits . If the Direction is Right, the output is divided by 2 Number of bits . For integer simulations, the shift right operation truncates the remainder of the division; for example, if the number 7 is shifted right one place, the result is 3. The same operation in a floating-point simulation results in 3.5. The Shift Operation output is a SystemDesigner bus with a 32-bit signed-integer or floating-point result. From the Output parameter box, you can limit the resulting output to either signed or unsigned numbers with fewer than 32 bits. Specifies the global clock used for the Shift Operation. The Clock can be set up using the SystemDesigner->Edit SystemDesigner Clocks... menu item or by placing a Start of Conversion Breakin. If you currently have a dialog box open in SIMetrix/SIMPLIS, cancel that dialog box so that the example can open in SIMetrix/SIMPLIS. Unzip the archive to a location on your computer. To open the schematic, double click the .sxsch file or drag that file into the SIMetrix/SIMPLIS Command Shell. The circuit example below uses an ADC to generate the input to the Shift Right operation, SHIFT_1. 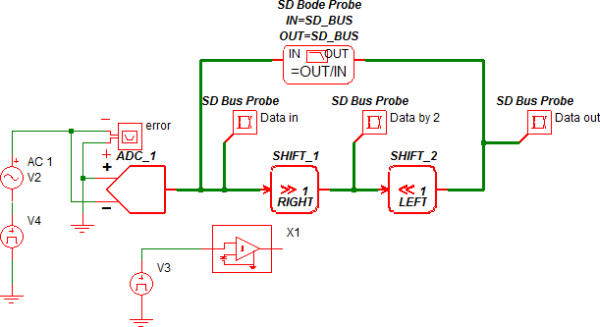 The Shift Right operation divides this bus by 2, causing truncation when the simulation is run in the integer-sampled data mode with the input bus equal to 7. 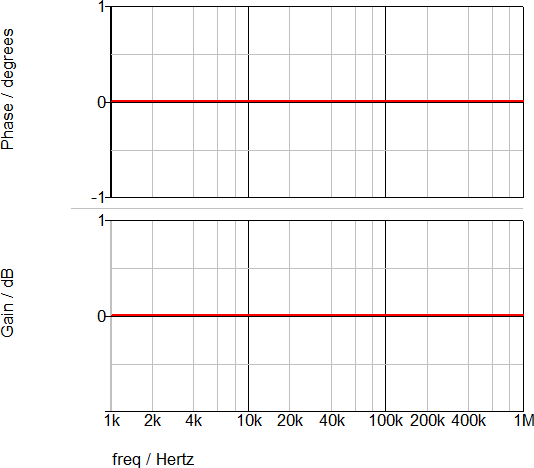 The Shift Left operation effectively gains the output of the Shift Right Operation, restoring the signal to the same amplitude as the input, excluding truncation errors. 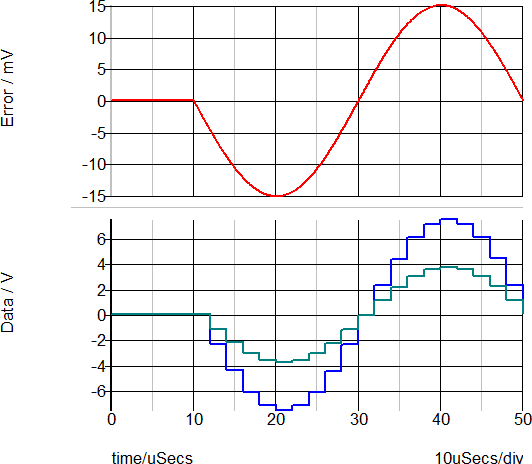 During floating-point simulations, the Shift operation "perfectly" divides the input signal, producing a double-precision floating-point output. The AC transfer function for the Shift Operation is shown below. 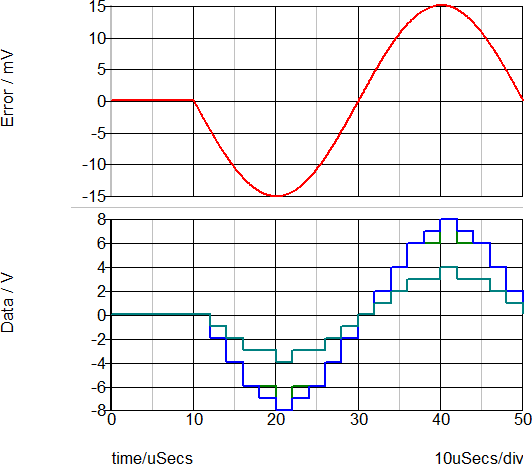 As expected, the gain is 0dB with no phase change.